The decision on whether to vaccinate dogs against Lyme disease remains an ongoing debate. Drs. Littman and Goldstein present two different viewpoints. 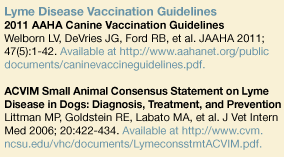 Despite availability of a consensus statement and up-to-date canine vaccination guidelines (see Lyme Disease Vaccination Guidelines), the decision whether or not to vaccinate dogs against Lyme disease remains an ongoing debate among many veterinary professionals. Today’s Veterinary Practice has gathered 3 experts to discuss this topic—Dr. Meryl Littman and Dr. Richard Goldstein evaluate the benefits and risks of vaccination, while Dr. Richard Ford outlines the current vaccination recommendations. As we investigate Lyme disease vaccination, the questions posed by the vaccinometer help highlight many unanswered questions and potential risks related to this vaccine. With these concerns in mind, I choose “first do no harm.” In other words, if we use proper tick control, vaccination is unnecessary. Question: What is the prevalence and risk of exposure/infection in your area (eg, infectiousness)? Answer: Risk of Lyme disease exposure/infection is high in my area, but proper tick control lowers the risk greatly. The CDC website2 shows that 95% of human Lyme disease is found in 12 endemic states in the Northeast, Mid-Atlantic, and Upper Midwest U.S. In some endemic areas, seroprevalence in healthy dogs is as high as 70% to 90%.3 In high-risk areas, risk of exposure can be lowered dramatically with adequate tick control, which also decreases the risk for other tick-borne diseases, such as anaplasmosis, babesiosis, bartonellosis, ehrlichiosis, and Rocky Mountain spotted fever. Question: How great is the risk of severe disease once the dog is infected (eg, pathogenicity and virulence)? Answer: Risk of Lyme disease becoming severe is low, but possibly somewhat higher in retriever dogs. Perhaps less than 2% of exposed dogs develop the more serious Lyme nephritis,5 an immune-mediated glomerulonephritis, with high Lyme disease-specific antigen–antibody circulating immune complexes (CICs) and deposition in glomeruli, causing protein-losing nephropathy (PLN).6 This entity has not been duplicated in any experimental model, and is seen mostly in Labrador and golden retrievers. However, even in seropositive retrievers, Lyme nephritis is uncommon,7 and we do not understand why some dogs develop it while many do not, despite their high titers and high CICs. It appears that a genetic predisposition exists, and that inflammation from Lyme antigens, and possibly inflammation from other infectious and inflammatory conditions, may be an environmental trigger. A genetic podocytopathy identified in soft-coated wheaten terriers8 may predispose them to further glomerular damage; a similar condition may exist in affected retrievers. Question: How effective is the vaccine? Answer: Not as effective as other vaccines we use. Lyme vaccines appear to prevent seroconversion or illness in most (60%–86%)3 vaccinates, but not consistently in all dogs, and not for a very long duration of immunity, thus annual (or even every 6 months10) boostering has been recommended. Question: How safe is the vaccine? Answer: These vaccines are not as safe as other vaccines we use. All canine Lyme disease vaccines contain outer surface protein A (OspA), which attaches the spirochete to the tick’s midgut and is expressed on Borrelia burgdorferi while in the tick, and induces anti-OspA antibodies. Remember, inflammation or deposition may be delayed for months after vaccination and not seem temporally related nor recognized as a problem associated with vaccination. Original reports of Lyme nephritis suspect cases19 demonstrated that 30% had received Lyme disease vaccine, from 2 weeks to 15 months prior to illness. There is no experimental model for Lyme nephritis, which makes it impossible to study whether Lyme disease vaccine prevents, sensitizes, or aggravates it. However, since the most serious forms of Lyme disease are immune-mediated, I choose not to administer Lyme vaccine antigens that may elevate Lyme disease specific CICs (that increase after vaccination, as they should), which would circulate and need to be cleared (or deposited) for weeks to months after vaccination. In addition, should we vaccinate retrievers (some of which are genetically predisposed dogs) that may develop Lyme nephritis or PLN? These patients are most likely the very ones we should NOT vaccinate lest we add more complexes or sensitize them for a more intense immune-mediated reaction when they are boostered or exposed naturally. Question: What is the potential for zoonotic spread to human contacts, and zoonotic spread to other dogs? Answer: Potential for zoonotic transmission of Lyme disease is minimal. B burgdorferi is transmitted via tick bites, and is not contagious from dogs to humans or dogs to dogs via excretions or blood transfusion. The reservoir hosts are wildlife, such as mice, small mammals, and birds. Seropositive dogs are sentinels that their human companions are at risk for exposure—not from dogs, but from ticks in the environment. Tick control is important: it prevents pets from acquiring the numerous tick-borne infectious agents, and prevents ticks from feeding on sentinel dogs, thereby acquiring the agent and transmitting it to their next host. Most dogs exposed to B burgdorferi seroconvert, but are nonclinical and do not need antibiotics.20 While most dogs do not exhibit illness after vaccination against Lyme disease, neither do dogs that are naturally exposed. Dogs that have Lyme arthritis respond quickly to inexpensive/safe antibiotics. Lyme disease vaccines have lower efficacy, shorter duration of immunity, and cause more post vaccinal adverse events than other vaccines we use. Without an animal model for Lyme nephritis, we do not know if the Lyme disease vaccine prevents, sensitizes, or causes more immune complex deposition in kidneys, especially in genetically predisposed dogs. Accordingly, the subset of dogs that possibly need the most protection (eg, retrievers) from the serious (immune-mediated) forms of Lyme disease may be the very ones predisposed to complications. In endemic regions, Lyme disease negative dogs should be vaccinated. As part of a Lyme disease prevention protocol, dogs must be vaccinated in addition to tick removal and control. One infected tick that escapes those first 2 barriers can easily cause infection. There is no evidence of any deleterious effects due to vaccinating Lyme disease negative dogs. In endemic regions, Lyme disease positive dogs with clinical signs should be vaccinated when risk of reinfection is high, and should receive antibiotic therapy, prior to or immediately following vaccination. 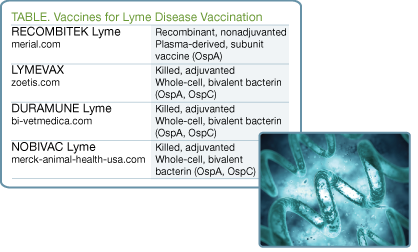 Lyme disease vaccination should be performed annually, with the currently available vaccines. In addition, tick control, even in vaccinated dogs, must be stressed to owners since very heavy exposure to Lyme disease may override vaccinal protection. There is a race to bring a “new” human Lyme disease vaccine to market, with some vaccines already in advanced stages of development.4, 5 A previous Lyme disease vaccine for humans had been approved for use in the U.S., but was removed from the market. The observation that this vaccine was unsuccessful due to lack of sales is often misused as an argument against canine Lyme disease vaccination. Compared to humans, dogs are lucky. There are currently 4 extremely safe, effective, and reliable vaccines7-9 (Table) on the market that have all been through the United States Drug Administration licensing requirements for safety, efficacy, purity, and potency. All available canine Lyme disease vaccines produce borreliacidal antibodies in the dog in response to vaccinal outer surface protein A (OspA). These antibodies work in the tick’s gut to bind the bacteria during the blood meal, sterilizing the gut of the tick and preventing transmission of bacteria into the dog. 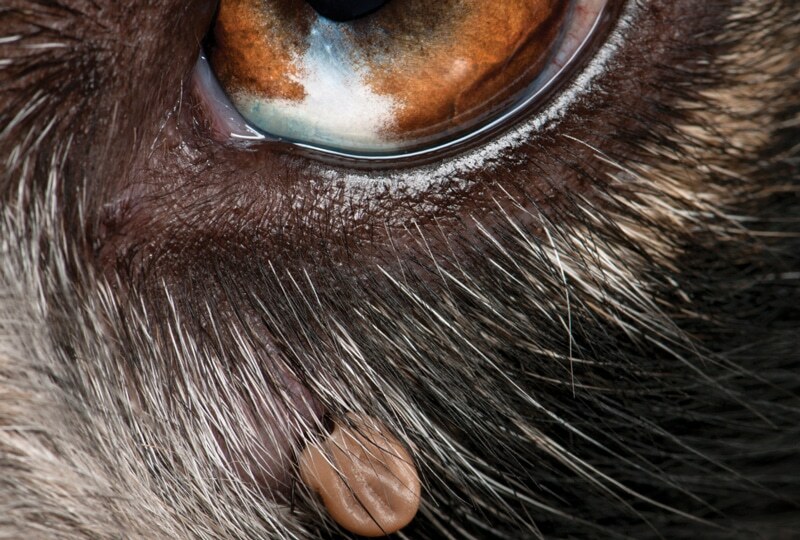 OspC is the main immunogenic protein exhibited by Borrelia in the tick’s salivary glands and in the dog’s body during natural infection. Three of the current Lyme disease vaccines contain 2 strains of inactivated Borrelia isolates—1 OspA producing strain and 1 unique OspC producing strain, which perhaps adds an additional layer of protection. These vaccines are extremely safe and, in conjunction with tick removal and control, prevent B burgdorferi infection and clinical Lyme disease, including Lyme nephritis. The anecdotal evidence for this fact is overwhelming, but it has also been shown prospectively in multiple controlled studies in experimental infection and in the field. Following are just a few of many examples of such evidence in the field. Millions of dogs that receive Lyme disease vaccines annually with no data to suggest any resulting harm from the vaccine. Concerns have also been raised that vaccination can contribute to clinical signs of Lyme disease or the syndrome known as Lyme nephritis.13 However, there is no evidence that Lyme nephritis is a vaccine-induced phenomenon or even commonly aggravated by vaccination. In addition to the evidence from the case study in guide dogs,12 I have evaluated or been a consultant on over 300 cases of dogs with Lyme nephritis; of these dogs, less than 10% were vaccinated. Moreover, I am not aware of a documented case in which a dog vaccinated against Lyme disease, but not infected with it, contracted Lyme nephritis. Ultimately, if we prevent Lyme disease, we prevent Lyme nephritis. The alternative—not vaccinating Lyme disease positive dogs and risking additional Lyme disease infections—is very likely more detrimental than the possible rare negative effects of vaccination. In the next issue of Today’s Veterinary Practice, Dr. Richard Ford will provide an in-depth discussion on Lyme disease vaccination guidelines in the Vital Vaccination column. Fiala J. Researcher creates tool to gauge vaccine needs. DVM360 Magazine 2003; available at http://veterinarynews.dvm360.com/dvm/article/articleDetail.jsp?id=70130. CDC website; available at http://www.cdc.gov/lyme/. Littman MP, Goldstein RE, Labato MA, et al. ACVIM small animal consensus statement on lyme disease in dogs: diagnosis, treatment, and prevention. J Vet Intern Med 2006; 20(2):422-434. Speck S, Reiner B, Streich WJ, et al. Canine borreliosis: A laboratory diagnostic trial. Vet Microbiol 2007; 120:132-141. Littman MP. State-of-the-art-review: Lyme nephritis. J Vet Emerg Crit Care 2013; 23:163-173. Littman MP. Protein-losing nephropathy in small animals. In Acierno MJ, Labato MA (eds): Kidney disease and renal replacement therapies. Vet Clin N Am Small Animal Pract 2011; 41(1):31-62. Goldstein RE, Cordner AP, Sandler JL, et al. Microalbuminuria and comparison of serologic testing for exposure to Borrelia burgdorferi in nonclinical Labrador and golden retrievers. J Vet Diagn Invest 2007; 19:294-297. Littman MP, Wiley CA, Raducha MG, Henthorn PS. Glomerulopathy and mutations in NPHS1 and KIRREL2 in soft coated wheaten terrier dogs. Mamm Genome 2013; 24:119-126. Beall MJ, Chandrashekar R, Eberts MD, et al. Serological and molecular prevalence of Borrelia burgdorferi, Anaplasma phagocytophilum, and Ehrlichia species in dogs from Minnesota. Vector Borne Zoonotic Dis 2008; 8:455-464. Topfer KH, Straubinger RK. Characterization of the humoral immune response in dogs after vaccination against the Lyme borreliosis agent: a study with five commercial vaccines using two different vaccination schedules. Vaccine 2007; 25:314–326. Moore GE, Guptill LF, Ward MP, et al. Adverse events diagnosed within three days of vaccine administration in dogs. JAVMA 2005; 227(7):1102-1108. Klingborg DJ, Hustead DR, Curry-Galvin EA, et al. 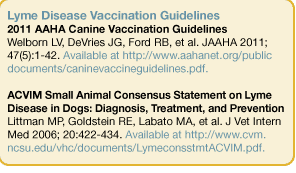 AVMA council on biologic and therapeutic agents’ report on cat and dog vaccines. JAVMA 2002; 221:1401-1407. Gondolf KB, Mihatsch M, Curschellas E, et al. Induction of experimental allergic arthritis with outer surface proteins of Borrelia burgdorferi. Arthritis Rheum 1994; 37:1070-1077. Steere AC, Drouin EE, Glickstein LJ. Relationship between immunity to Borrelia burgdorferi outer-surface protein A (OspA) and Lyme arthritis. Clin Inf Dis 2011;52 (Suppl 3):S259-S265. Lim LC, England DM, DuChateau BK, et al. Development of destructive arthritis in vaccinated hamsters challenged with Borrelia burgdorferi. Infect Immun 1994; 62:2825–2833. Croke CL, Munson EL, Lovrich SD, et al. Occurrence of severe destructive Lyme arthritis in hamsters vaccinated with outer surface protein A and challenged with Borrelia burgdorferi. Infect Immun 2000; 68:658-663. Littman MP. Perspectives in veterinary medicine: Why I don’t use Lyme disease vaccines. Comp Cont Ed Pract Vet 1997; 19(11):1269, 1272, 1274-1275. Littman MP. 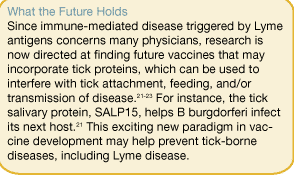 Immune-mediated reactions against Lyme vaccines. ACVIM Proc 2000; pp 629-630. Dambach DM, Smith CA, Lewis RM, Van Winkle TJ. Morphologic, immunohistochemical, and ultrastructural characterization of a distinctive renal lesion in dogs putatively associated with Borrelia burgdorferi infection: 49 cases (1987–1992). Vet Pathol 1997; 34:85-96. Littman MP. A matter of opinion: Should we treat asymptomatic, nonproteinuric Lyme-seropositive dogs with antibiotics? Clin Brief 2011; 9:13-16. Dai J, Wang P, Adusumilli S, et al. 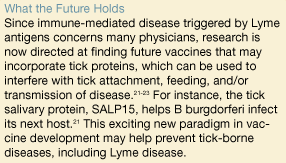 Antibodies against a tick protein, Salp15, protect mice from the Lyme disease agent. Cell Host Microbe 2009; 6(5):482-492. Schuijt TJ, Hovius JW, van der Poll T, et al. 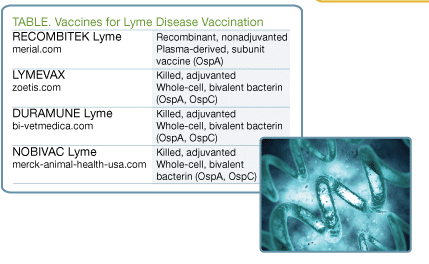 Lyme borreliosis vaccination: The facts, the challenge, the future. Trends Parasitol 2011; 27:40-47. Embers ME, Narasimhan S. Vaccination against Lyme disease: Past, present, and future. Front Cell Inf Microbio 2013; 3(6):1-15. Kuehn BM. CDC estimates 300,000 US cases of Lyme disease annually. JAMA 2013; 310(11):1110. Grimm D, Tilly K, Byram R, et al. Outer-surface protein C of the Lyme disease spirochete: A protein induced in ticks for infection of mammals. Proc Natl Acad Sci USA 2004; 101(9):3142-3147. Nadelman RB, Hanincová K, Priyanka Mukherjee P, et al. Differentiation of reinfection from relapse in recurrent lyme disease. N Engl J Med 2012; 367:1883-1888. Embers ME, Narasimhan S. Vaccination against Lyme disease: Past, present, and future. Front Cell Infect Microbiol 2013; 3:6. Barrett PN, Portsmouth D. A novel multivalent OspA vaccine against Lyme borreliosis shows promise in Phase I/II studies. Expert Rev Vaccines 2013; 12(9):973-975. Plotkin SA. Correcting a public health fiasco: The need for a new vaccine against Lyme disease. Clin Infect Dis 2011; 52(3):S271-S275. LaFleur RL, Callister SM, Dant JC, et al. One-year duration of immunity induced by vaccination with a canine Lyme disease bacterin. Clin Vaccine Immunol 2010; 17(5):870-874. LaFleur RL, Dant JC, Wasmoen TL, et al. Bacterin that induces anti-OspA and anti-OspC borreliacidal antibodies provides a high level of protection against canine Lyme disease. Clin Vaccine Immunol 2009; 16(2):253-259. Conlon JA, Mather TN, Tanner P, et al. Efficacy of a nonadjuvanted, outer surface protein A, recombinant vaccine in dogs after challenge by ticks naturally infected with Borrelia burgdorferi. Vet Ther 2000; 1(2):96-107. Levy SA, Lissman BA, Ficke CM. Performance of a Borrelia burgdorferi bacterin in borreliosis-endemic areas. JAVMA 1993; 202(11):1834-1838. Hebert D, Eschner A. Seroprevalence of Borrelia burgdorferi-specific C6 antibody in dogs before and after implementation of a nonadjuvanted recombinant outer surface protein A vaccine in a Rhode Island small animal clinic. Vet Ther 2010; 11(3). Personal communication with Jody Sandler, DVM, Director of Veterinary Services, Guiding Eyes for the Blind, Yorktown, New York. Goldstein RE, Atwater DZ. Serologic and circulating immune complex analysis in dogs naturally infected with Borrelia burgdorferi (abstract). ACVIM Forum Proc 2006. Goldstein RE, Atwater DZ. Serology and circulating immune complexes in dogs naturally infected with Borrelia burgdorferi before and after doxycycline therapy (abstract). ACVIM Forum Proc 2006. Meryl P. Littman, VMD, Diplomate ACVIM, is a professor of medicine at the University of Pennsylvania School of Veterinary Medicine. Her research includes canine tickborne diseases. She received her VMD from University of Pennsylvania. Richard E. Goldstein, DVM, Diplomate ACVIM & ECVIM (Companion Animal), is chief medical officer at The Animal Medical Center in NYC. His research includes canine Lyme disease and leptospirosis. He received his DVM from Koret School of Veterinary Medicine, Hebrew University of Jerusalem, Israel.